This post is Part 1 in a three part series on Stocking Your Pantry, Fridge, and Freezer to make pulling together Millennial Menus a breeze. We're starting off with the pantry, because everyone knows all you need in your fridge is beer and all you need in your freezer is ice cream, right? Just kidding. But the pantry is the foundation of your kitchen, and having it stocked correctly will save you a lot of time and money. This list is comprehensive, but it shouldn't be frivolous - I used to cook with a lot of special ingredients that I only used for one meal, and that became pretty expensive and pretty inefficient. Now, what I have in the house can easily turn into dozens of different meals. Sometimes I only need to get one or two ingredients for a dish at the grocery store, and there are even a good number of recipes that I make that are entirely "Millennial Staple Meals" - meaning I always have every ingredient on hand to make at any time. Using this list as the base of your pantry will encourage you to eat healthier by cooking for yourself, and save you money! Sesame oil - for Asian-inspired dishes, this flavorful oil can transform a piece of meat or vegetables and is a must-buy for simple stir fry. You'll find yourself reaching for it all the time. Buy this normally splurge-level ingredient for cheap at Trader Joe's! Balsamic glaze reduction - If you like balsamic, you should keep this sweeter, thicker version around for tomato mozzarella & basil salads, beet, kale & goat cheese salads, glazed salmon, brussel sprouts, and chicken. Buy this normally splurge-level ingredient for cheap at Trader Joe's! Red wine vinegar - In addition to balsamic, this is a great second vinegar to keep on hand out of the many vinegar options out there. Balsamic can take over a dish (which can be a good thing) but red wine vinegar is perfect for less in-your-face flavor. Use it for salad dressings and marinades. Soy sauce - Just like sesame oil, a must for any Asian-inspired dish - especially for stir fry, which is a super simple dinner. Awesome in sauces and marinades. Honey - In addition to sweetening tea, baked goods, and other drinks, honey is also critical in homemade salad dressing, marinades, glazes, in smoothies, on apples, on sandwiches (banana + pb is my go-to), on yogurt, as a healthy snack on toast or an english muffin with nut butter. Kosher salt - for anything you would normally use salt for. Kosher salt is preferred by chefs to the iodized table salt that you're probably used to using, which has additives and isn't as flavorful as kosher salt. Black Peppercorn grinder - fresh ground pepper tastes way better than that powdery stuff. Garlic powder - flavor in an instant if you don't have fresh garlic on hand. I prefer garlic powder for a few things, like home fries or dry rubs on meat. Curry powder - Curries are cheap to make and super flavorful. I use it for an easy curry with coconut milk and to make curried chicken salad. Fajita/Taco spice packet - I use this for Dorito Chicken (recipe coming soon - if that doesn't convince you to Subscribe to the blog, idk what will), any taco/fajita/burrito night recipe, and Seven Layer Dip. I don't usually use a whole seasoning packing in one sitting, so I just tape up the rest and store it in a small plastic baggie. 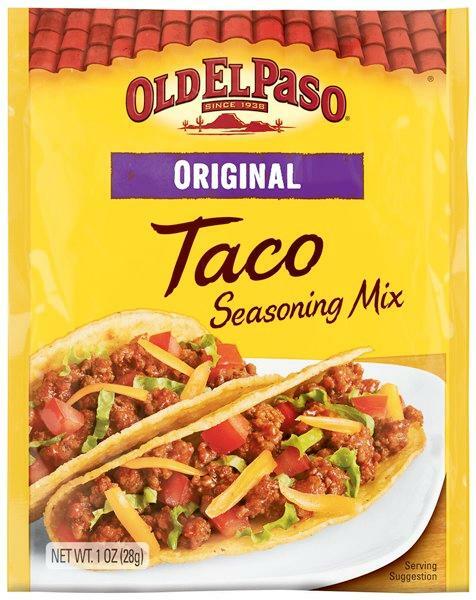 You can also make your own taco seasoning if you're feeling up to it. Za'atar - The newest addition to my spice cabinet, za'atar, is a blend of thyme, sesame seeds, and sumac that adds depth to any dish. Use it with any roasted vegetable (I love eggplant, tomatoes, and kale, chickpeas, and kale), chicken, bread, or potatoes. It's central to my Middle Eastern Grain Bowls. I talk more about za'atar on the Grocery Guide for the grain bowls. Cinnamon - Essential for sprinkling on oatmeal, toast, baked goods, and even savory recipes. Optional: dried herbs, including dried oregano, basil, thyme and rosemary. I personally prefer fresh herbs, and will be including a post about growing your own herb garden indoors soon (Subscribe to read it first). I do keep all of these in my spice cabinet, I just don't find myself reaching for them very often. Bread - Super important for sandwiches for lunch and toast as a healthy breakfast, snack or to satisfy a late night craving. Even though I'm only one person, I was surprised to find out I can use an entire loaf of bread before it gets moldy, so you shouldn't have to worry about that - you can always pop it in the fridge to keep it fresh longer. Pasta - Always on hand for a quick dinner with Rao's tomato sauce or pesto, plus countless other uses. Keep at least one or two shapes you like. I love whole wheat spaghetti. Quinoa - Quinoa is super versatile and relatively simple to make in big batches and keep on hand for the week. Quinoa is super in right now and there are literally thousands of recipes online that call for it - from the highlight of the meal to adding a scoop to your salads or using it as a side dish. I also use it in my Five Minute Fish Taco Bowls and Freezer Friendly Mexican Stuffed Peppers. Farro - Farro is my other go-to grain to keep in my cabinet. It has more of a whole-grain feel to it, but has a mild flavor so it can really go with anything. I use it in just about anything - soup, with salads, and as a base of a bowl like my Middle Eastern Grain Bowls. Some other options for grains you could keep on hand include bulgur and millet. Lentils - I have a newfound love of lentils - they're an awesome meat-free source of protein and are simple as an entree, side dish, in a salad, or in a soup, like my favorite Red Lentil Soup With Lemon. They're also SO cheap. I keep brown lentils (versatile and most common) and red lentils (mostly for that amaze soup) on hand. You can also buy cooked lentils in a can or even pre-steamed lentils from Trader Joe's. You're welcome. Rolled oats - Always have a healthy breakfast on hand: rolled oats + milk + bedtime = overnight oats (this is really trendy right now, if you were wondering). Also great for making hot oatmeal (duh) and tossing into baked goods (healthy). Nuts - One of the healthiest (and most filling) non-perishable snacks. I always have pistachios and almonds for snacking, plus a bag of sliced honey roasted almonds (from Trader Joe's, of course) for oatmeal and topping salads. Peanut butter (or other nut butter) - Use it for healthy snacking and sandwiches, and sometimes even sauces! I love toast with peanut butter, honey, and banana, and always make pb+banana sandwiches for on-the-go lunches when I don't have access to a fridge and don't want to bring a lunchbox. Enjoy peanut butter with apples, banana, on crackers, on an english muffin, on celery with raisins for the kid classic ants on a log. It will keep you full and is packed with protein. I also buy almond butter from Aldi's at a great low price to mix it up a bit. Flour - I like to bake, so I keep a larger bag of all-purpose flour on hand, but it's good to always have at least a small bag of flour for breading and cooking - I use it to bread chicken, eggplant parmesan, Coconut Shrimp, and more. Flour can be used to thicken sauces, too. Sugar and/or brown sugar - For coffee, tea, oatmeal, desserts, and baking. Red and/or yellow onions - Onions last for months in the pantry in a cool, dry place. A cut onion will last a week or more in your fridge, so it's okay not to use a whole onion at once. Red: for salads, salsa, eggs, and spontaneous guacamole-making. Yellow: To add flavor to any dish last minute, from risotto to pasta to soups to making caramelized onions. Garlic - Garlic makes almost everything taste better. It will pump up the flavor in literally any dish, marinade, or dressing. Don't forget to grab a garlic press before moving in, it's one of my 5 Kitchen Essentials for Your First Place. Potatoes/sweet potatoes - A baked sweet potato is my go-to side for any meal, so I always have a few on hand. You can also keep regular potatoes on hand. Either way, you can make them a baked potato in minutes in the microwave. Bananas - Good to have on hand for throwing in a smoothie, enjoying with peanut butter, or putting on toast. Bananas are also good for on-the-go snacks because you can just throw one in your bag. When they get too brown, you can make banana ice cream or banana bread, my favorite recipe is for Healthy Banana Muffins. What's a must-have in your pantry? Let me know in the comments below.